In violation of the Treaty of Versailles, the Kriegsmarine grew rapidly during German naval rearmament in the 1930s. The 1919 treaty had limited the size of the German navy previously, and prohibited the building of submarines. Under the terms of the 1919 Treaty of Versailles, Germany was only allowed a minimal navy of 15,000 personnel, six capital ships of no more than 10,000 tons, six cruisers, twelve destroyers, twelve torpedo boats and no submarines or aircraft carriers. Military aircraft were also banned, so Germany could have no naval aviation. Under the treaty Germany could only build new ships to replace old ones. All the ships allowed and personnel were taken over from the Kaiserliche Marine, renamed Reichsmarine. The launching of the first pocket battleship, Deutschland in 1931 (as a replacement for the old pre-dreadnought battleship Preussen) was a step in the formation of a modern German fleet. The building of the Deutschland caused consternation among the French and the British as they had expected that the restrictions of the Treaty of Versailles would limit the replacement of the pre-dreadnought battleships to coastal defence ships, suitable only for defensive warfare. By using innovative construction techniques, the Germans had built a heavy ship suitable for offensive warfare on the high seas while still abiding by the letter of the treaty. The first military action of the Kriegsmarine came during the Spanish Civil War (1936–1939). Following the outbreak of hostilities in July 1936 several large warships of the German fleet were sent to the region. The heavy cruisers Deutschland and Admiral Scheer, and the light cruiser Köln were the first to be sent in July 1936. These large ships were accompanied by the 2nd Torpedo-boat Flotilla. The German presence was used to covertly support Franco's Nationalists although the immediate involvement of the Deutschland was humanitarian relief operations and evacuating 9,300 refugees, including 4,550 German citizens. Following the brokering of the International Non-Intervention Patrol to enforce an international arms embargo the Kriegsmarine was allotted the patrol area between Cabo de Gata (Almeria) and Cabo de Oropesa. Numerous vessels served as part of these duties including Admiral Graf Spee. On 29 May 1937 the Deutschland was attacked off Ibiza by two bombers from the Republican Air Force. Total casualties from the Republican attack were 31 dead and 110 wounded, 71 seriously, mostly burn victims. In retaliation the Admiral Scheer shelled Almeria on 31 May killing 19-20 civilians, wounding 50 and destroying 35 buildings. Following further attacks by Republican submarines against the Leipzig off the port of Oran between 15–18 June 1937 Germany withdrew from the Non-Intervention Patrol. The Kriegsmarine participated in the Battle of Westerplatte and the Battle of the Danzig Bay during the Invasion of Poland. In 1939, major events for the Kriegsmarine were the sinking of the British aircraft carrier HMS Courageous and the British battleship HMS Royal Oak and the loss of the Admiral Graf Spee at the Battle of the River Plate. Submarine attacks on Britain's vital maritime supply routes (Battle of the Atlantic) started immediately at the outbreak of war, although they were hampered by the lack of well placed ports from which to operate. Throughout the war the Kriegsmarine was responsible for coastal artillery protecting major ports and important coastal areas. It also operated anti-aircraft batteries protecting major ports. In February 1942, the three large warships stationed on the Atlantic coast at Brest were evacuated back to German ports for deployment to Norway. The ships had been repeatedly damaged by air attacks by the RAF, the supply ships to support Atlantic sorties had been destroyed by the Royal Navy, and Hitler now felt that Norway was the "zone of destiny" for these ships. The two battleships Scharnhorst and Gneisenau and the heavy cruiser Prinz Eugen passed through the English Channel (Channel Dash) on their way to Norway despite British efforts to stop them. Not since the Spanish Armada in 1588 had any warships in wartime done this. It was a tactical victory for the Kriegsmarine and a blow to British morale, but the withdrawal removed the possibility of attacking allied convoys in the Atlantic with heavy surface ships. On 16 July 1941, Fregattenkapitän Dr. Hans Kawelmacher was appointed the German naval commandant in Liepāja. On 22 July, Kawelmacher sent a telegram to the German Navy's Baltic Command in Kiel, which stated that he wanted 100 SS and fifty Schutzpolizei ("protective police") men sent to Liepāja for "quick implementation Jewish problem". Kawelmacher hoped to accelerate killings complaining: "Here about 8,000 Jews... with present SS-personnel, this would take one year, which is untenable for [the] pacification of Liepāja." 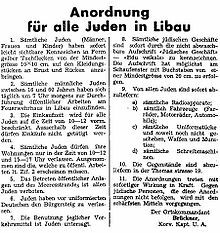 Kawelmacher on 27 July 1941: "Jewish problem Libau largely solved by execution of about 1,100 male Jews by Riga SS commando on 24 and 25.7." After the war, the German surface ships that remained afloat (only the cruisers Prinz Eugen and Nürnberg, and a dozen destroyers were operational) were divided among the victors by theTripartite Naval Commission. The US used the heavy cruiser Prinz Eugen in nuclear testing at Bikini Atoll in 1946 as target ship. Some (like the unfinished aircraft carrier Graf Zeppelin) were used for target practice with conventional weapons, while others (mostly destroyers and torpedo boats) were put into the service of Allied navies that lacked surface ships after the war. The training barque SSS Horst Wessel was recommissioned USCGC Eagle and remains in active service, assigned to the United States Coast Guard Academy. The British, French and Soviet navies received the destroyers, and some torpedo boats went to the Danish and Norwegian navies. For the purpose of mine clearing, the Royal Navy employed German crews and minesweepers from June 1945 to January 1948, organized in the German Mine Sweeping Administration, the GMSA, which consisted of 27,000 members of the former Kriegsmarine and 300 vessels. By the start of World War II, much of the Kriegsmarine were modern ships: fast, well-armed and well-armoured. This had been achieved by concealment but also by deliberately flouting World War I peace terms and those of various naval treaties. However, the war started with the German Navy still at a distinct disadvantage in terms of sheer size with what were expected to be its primary adversaries – the navies of France and Great Britain. Although a major re-armament of the navy (Plan Z) was planned, and initially begun, the start of the war in 1939 meant that the vast amounts of material required for the project were diverted to other areas. The sheer disparity in size when compared to the other European powers navies prompted German naval commander in chief Grand Admiral Erich Raeder to write of his own navy once the war began "The surface forces can do no more than show that they know how to die gallantly." A number of captured ships from occupied countries were added to the German fleet as the war progressed. 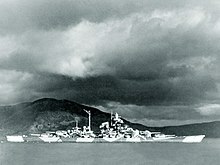 Though six major units of the Kriegsmarine were sunk during the war (both Bismarck-class battleships and both Scharnhorst-class battleships, as well as two heavy cruisers), there were still many ships afloat (including four heavy cruisers and four light cruisers) as late as March 1945. The "Pocket battleships" were the Deutschland (renamed Lützow), Admiral Scheer, and Admiral Graf Spee. Modern commentators favour classifying these as "heavy cruisers" and the Kriegsmarine itself reclassified these ships as such (Schwere Kreuzer) in 1940. In German language usage these three ships were designed and built as "armoured ships" (Panzerschiffe) – "pocket battleship" is an English label. Although the German World War II destroyer (Zerstörer) fleet was modern and the ships were larger than conventional destroyers of other navies, they had problems. Early classes were unstable, wet in heavy weather, suffered from engine problems and had short range. Some problems were solved with the evolution of later designs, but further developments were curtailed by the war and, ultimately, by Germany's defeat. In the first year of World War II, they were used mainly to sow offensive minefields in shipping lanes close to the British coast. Types XXI and XXIII, the "Elektroboot", would have negated much of the Allied anti-submarine tactics and technology, but only a few of this new type of U-boat became ready for combat at the end of the war. Post-war, they became the prototypes for modern submarines, in particular, the Soviet Whiskey class. The Luftwaffe had a near-complete monopoly on all German military aviation, including naval aviation, a major source of ongoing interservice rivalry with the Kriegsmarine. Catapult-launched spotter planes like Arado Ar 196 twin-float seaplanes were manned by the so-called Bordfliegergruppen ("shipboard flying group"). In addition, Trägergeschwader 186 (Carrier Air Wing 186) operated two Gruppen (Trägergruppe I/186 and Trägergruppe II/186) equipped with navalized Messerschmitt Bf 109T and Junkers Ju 87C Stuka; these units were intended to serve aboard the aircraft carrier Graf Zeppelin which was never completed, yet provided the Kriegsmarine with some air-power from bases on land. Furthermore, five coastal groups (Küstenfliegergruppen) with reconnaissance aircraft, torpedo bombers, Minensuch aerial minesweepers and air-sea rescue seaplanes supported the Kriegsmarine, although with lesser resources as the war progressed. With the Invasion of Normandy in June 1944 and the Soviet advance from the summer of 1944 the Kriegsmarine started to form regiments and divisions for the battles on land with superfluous personnel. 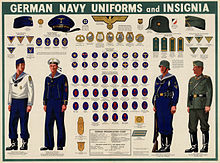 With the loss of naval bases because of the Allied advance more and more navy personnel were available for the ground troops of the Kriegsmarine. About 40 regiments were raised and from January 1945 on six divisions. Half of the regiments were absorbed by the divisions. ^ Koop, Gerhard; Schmolke, Klaus-Peter (1999). Battleships of the Scharnhorst Class. Annapolis: Naval Institute Press. p. 111. ISBN 978-1-55750-045-8. ^ Hellwinkel, Lars (2014). Hitler's Gateway to the Atlantic: German Naval Bases in France 1940-1945 (Kindle, English Translation ed.). Barnsley: Seaforth Publishing. p. Kindle location 731 of 4855. ISBN 978 184832 199 1. ^ Sieche, Erwin (4 May 2007). "German Naval Radar to 1945". Naval Weapons of the World. Retrieved 23 December 2012. ^ a b (in Latvian) Kurzemes Vārds, 5 July 1941, page 1, at website of National Library of Latvia. ^ E. Gröner, Die Schiffe der deutschen Kriegsmarine. 2nd Edition. 1976, München, Lehmanns Verlag. ^ Ireland, Bernard (2003). Battle of the Atlantic. Barnsley, UK: Pen & Sword Books. p. 32. ISBN 1-84415-001-1. ^ Ireland, Bernard (2003). Battle of the Atlantic. Barnsley, UK: Pen & Sword Books. p. 225. ISBN 1-84415-001-1. ^ "U-boats after World War Two - Fates - German U-boats of WWII - Kriegsmarine - uboat.net". uboat.net. Retrieved 8 May 2018. ^ Pipes, Jason (1996–2006). "Organization of the Kriegsmarine". Feldgrau.com. Retrieved 31 August 2007. ^ Lienau, Peter (22 October 1999). "The Working Environment for German Warship design in WWI and WWII". Naval Weapons of the World. Retrieved 23 December 2012. ^ Gesamtstärke der Kriegsmarine am 1. Mai 1943 2012-09-27.